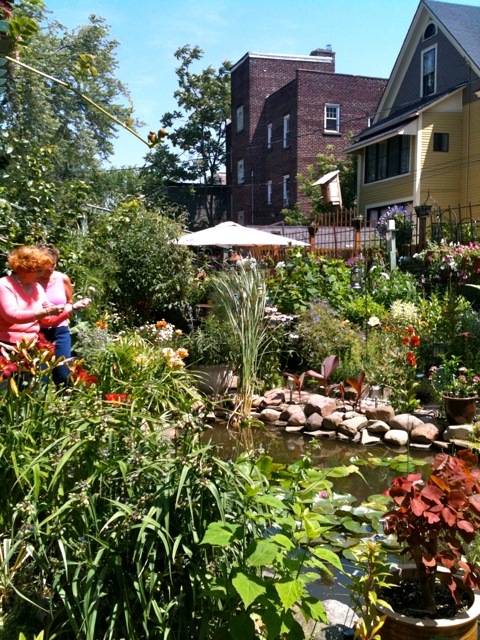 This is another garden of which I can't get enough. 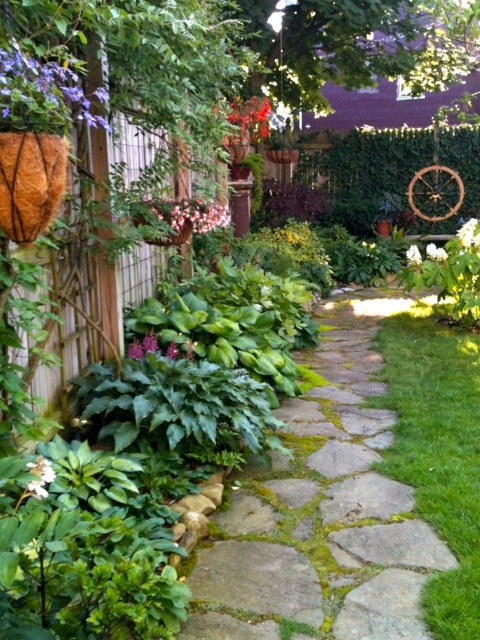 Gardeners Brian & Gordon work tirelessly to keep this phenomenal garden going each year. 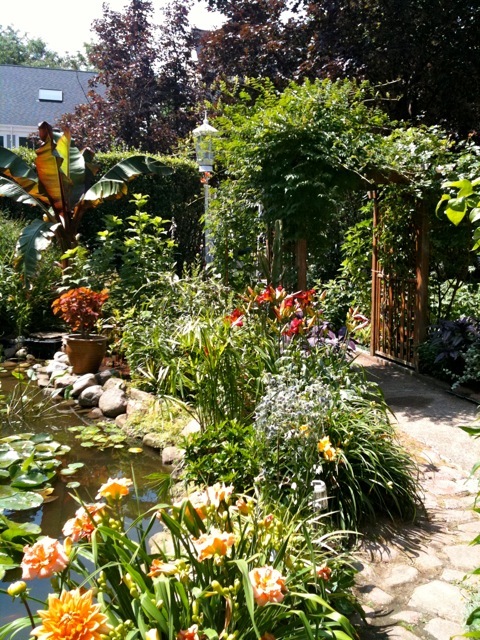 More than 17 years after moving in, the small lawn of all grass can hardly be imagined in this urban garden with two ponds, meandering paths, sitting areas, arbors, hundreds of perennials, colorful annuals and tropicals -- capped off with a tiki bar. 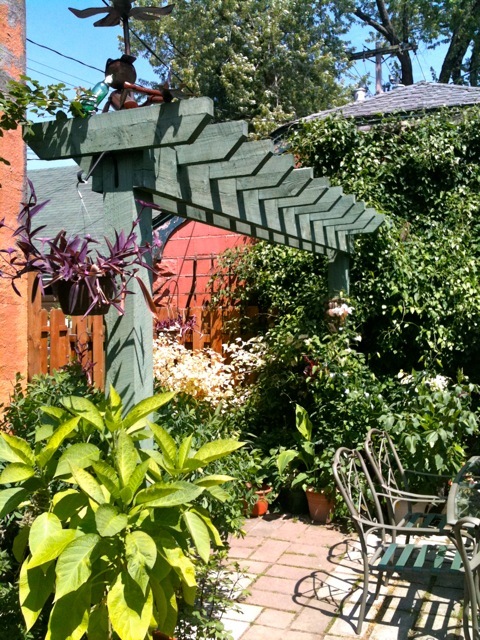 Tall green hedges surround the Bird Avenue garden, steps from busy Elmwood Avenue, so from the street there's no telling what's behind "the green wall." The meandering paths don't give up much of the garden at all, which is divided into garden "rooms" -- each worth exploring on their own. 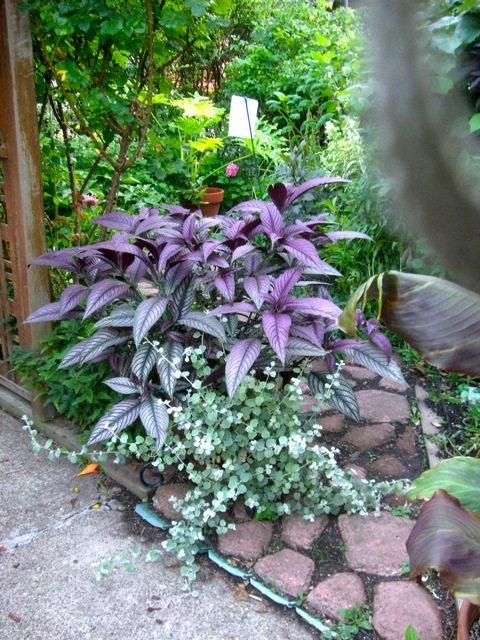 The combination of tropical plants, typical annuals and expected Zone 5 perennials makes for great color and texture combinations, not often seen in gardens this far north. 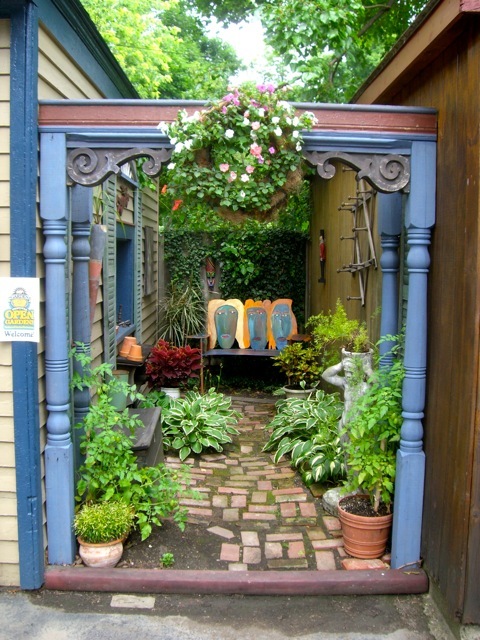 Add to that the terracotta color of the house, the teal house trim, brick garage, green tiki bar and arbors, and creative and unusual planters and you get a colorful garden worthy of a painting (of which artists have painted). And there's not a single bad camera angle in the whole space. 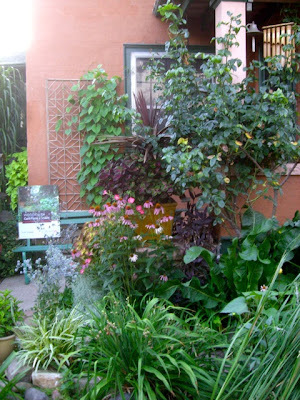 There is no vantage point to see the garden in whole -- unless it's from their second-floor apartment. The bottom floor they rent out -- can you imagine having this garden out your front door as a renter? 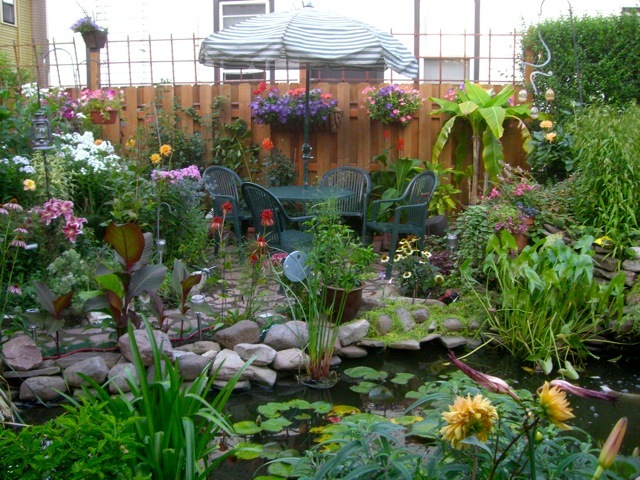 This is probably the hardest partying garden in all of Buffalo. And that's saying a lot. 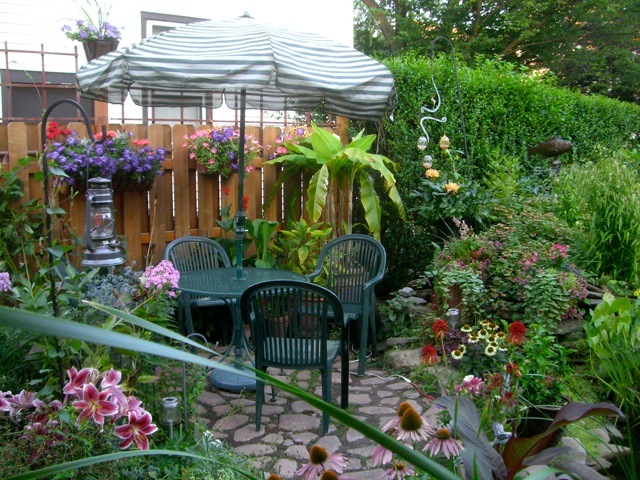 Garden parties are frequent and intense from May through September in Buffalo. 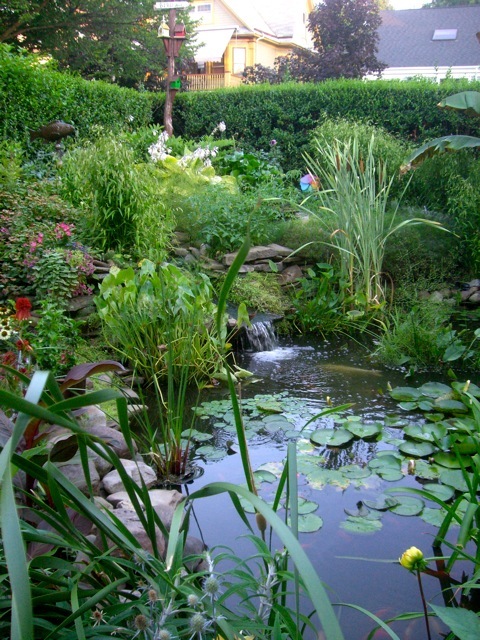 They've also had fundraising parties in their garden for an art museum and the National Garden Festival, on top of their seemingly weekly private parties. They were also kind enough to host a happy hour (or so) for the 72 garden bloggers that came to Buffalo for the Garden Bloggers Meet-up in 2010. They weren't the least bit phased with having two buses of garden bloggers visiting. 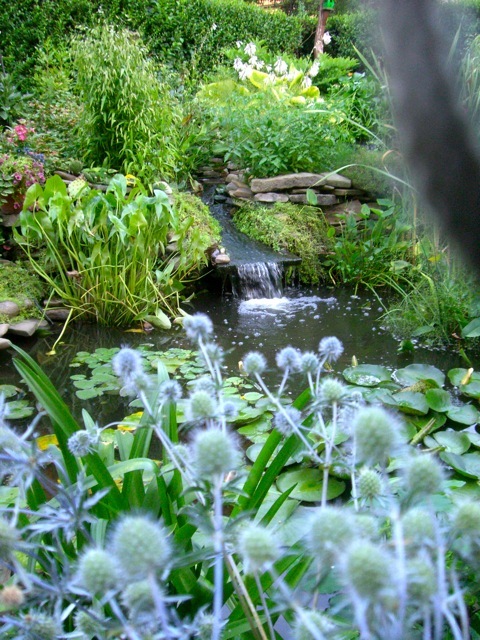 It was a "soft rain" that day, so not sure everyone got an ideal view of the garden, or the best photos. Drinks were good anyway. 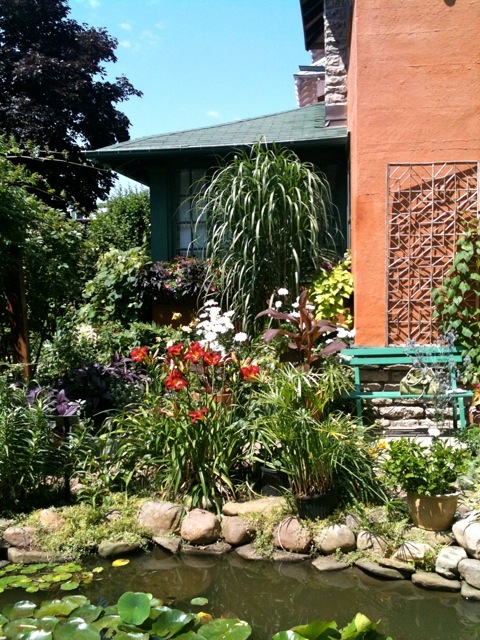 This garden's also been on TV often, on Channel 7's AM Buffalo, as well as featured on Sally Cunningham's Sunday morning Channel 4 gardening segments. 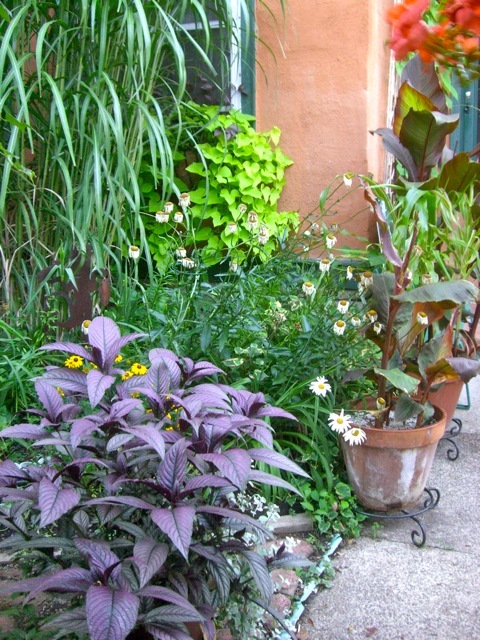 It can also be seen in Garden Walk Buffalo, the book and DVD, as well as many regional & national magazine articles over the years. 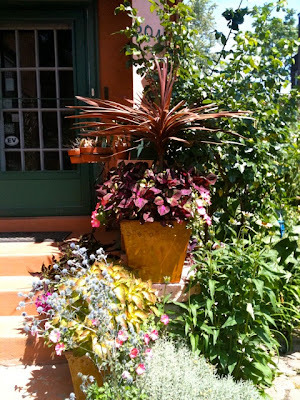 Brian is a collector of dahlias -- a collection worth bragging about. Gordon? 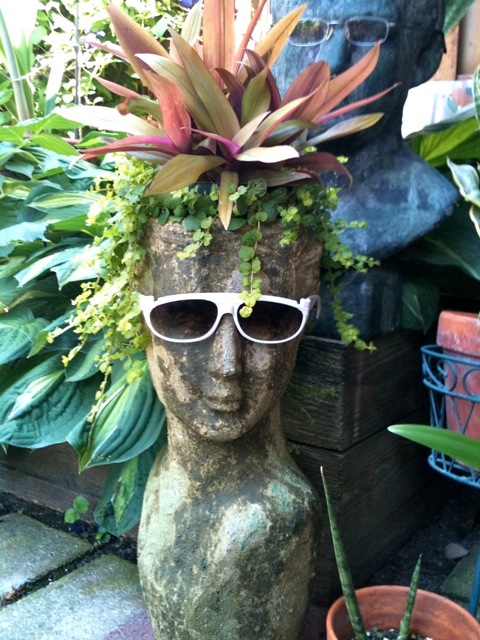 He collects art, friends, and large tropical plants. So large in fact, he has some stored by the Buffalo & Erie County Botanical Gardens over winter. 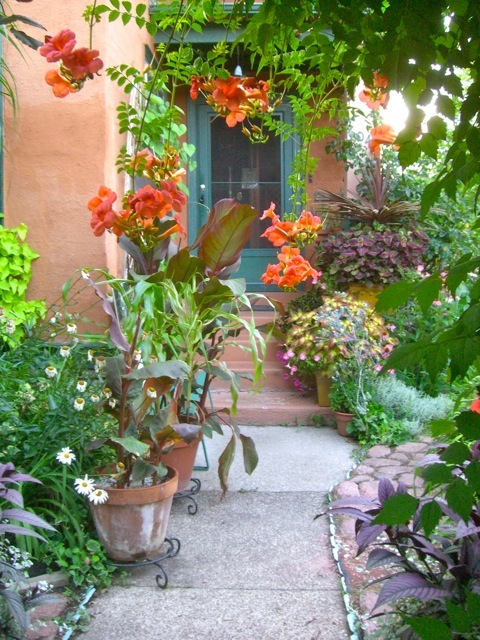 Their vegetable gardens are all grown in homemade container contraptions on the driveway, out of sight of the main garden. 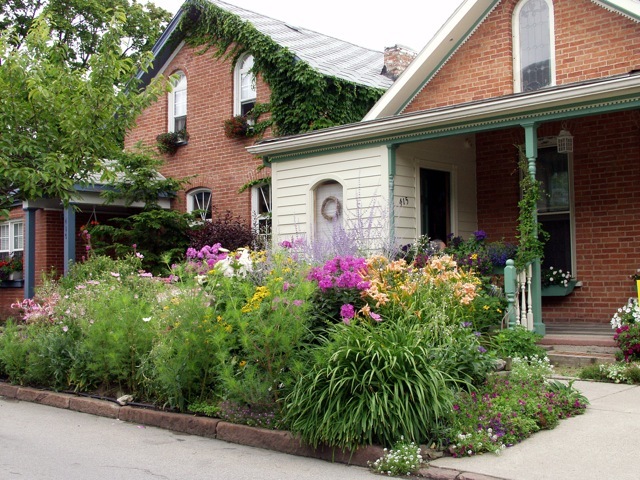 Gordon's also on the Botanical Gardens Board and is a past Garden Walk Buffalo committee member, helping the group grow during its formative years. I've told Gordon often that he should have a garden blog. 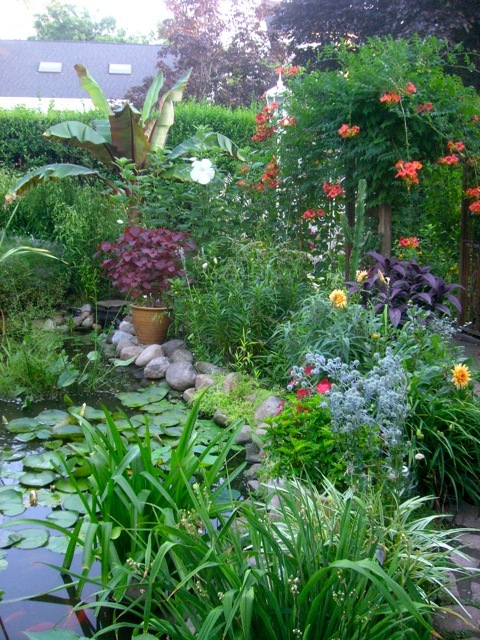 There's a lot to share in their garden, let alone the tips, tricks and techniques they've both picked up over the years. Eventually. They have so much plant material, they often sell cuttings, divisions and extras throughout the season. You won't find the garden on Garden Walk Buffalo (we have a strict policy of not selling items of any kind), but their garden still gets lots of visitors that weekend, just 'cause people are used to going there. 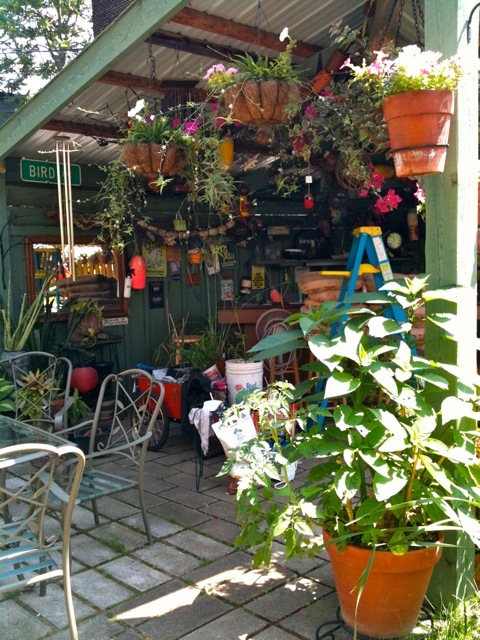 And they generally have plants for sale. 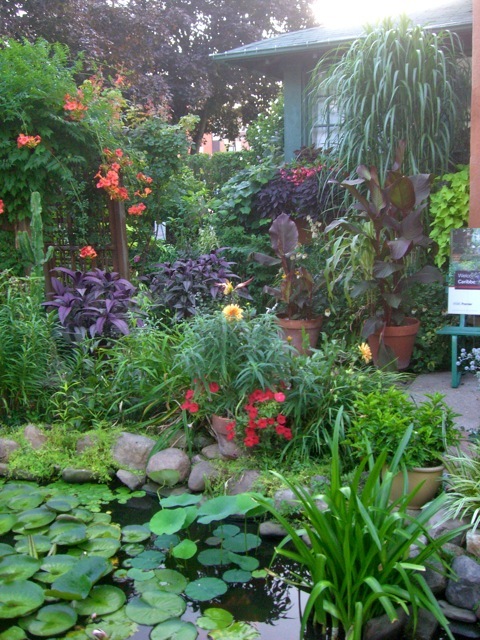 Being the Garden Walk Buffalo president, I would only encourage folks to visit gardens actually on the Garden Walk map that last full weekend of July, but if you do stop by their garden, tell 'em I said hey. 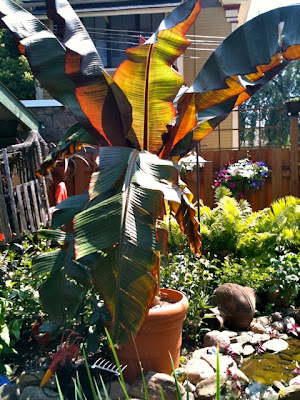 As a lifelong zone 7+ gardener, it has not gone well for me since being relocated 11 years ago to zone 5. For me, this blog entry is very inspiring. Oh, I remember that tiki bar! 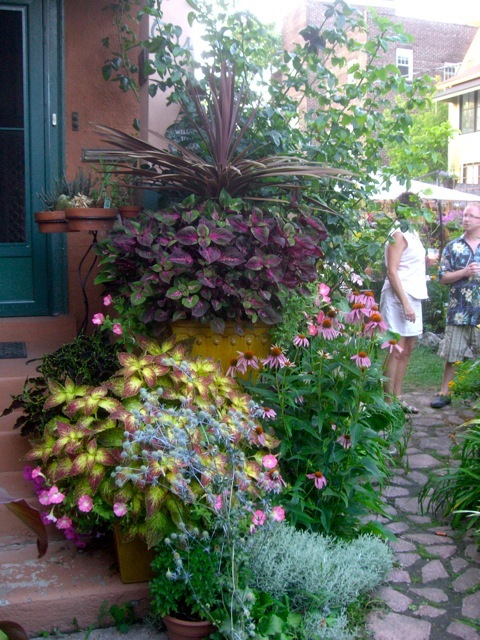 What a fun garden this was at the Buffalo Fling, and the hosts were so great. Thanks for the revisit. Karen, these fence toppers are actually treated wood trellises and the slip right between the dog eared (shadow) fence boards at the top. This makes it possible to remove them should we need to. It also extends the legal fence height of 6 ft. so we can grow climbing vines during the summer months increasing our privacy! Jim, thanks for the very complimentary story! Gordon and Brian. 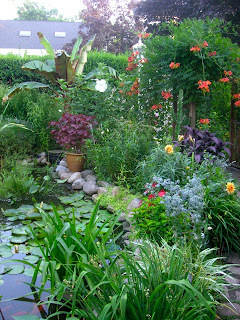 Wow what gardens! Have you been featured in a magazine yet! If not you should! 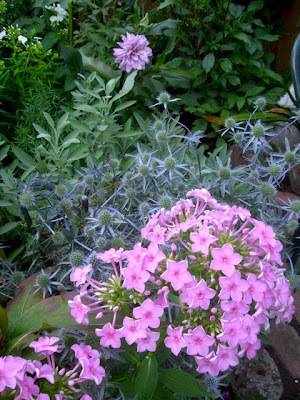 What are the pink star-shaped flowers in photo 3? There's sea holly behind them. I too love tropicals but my banana plants leaves get torn by wind. How do you prevent that? 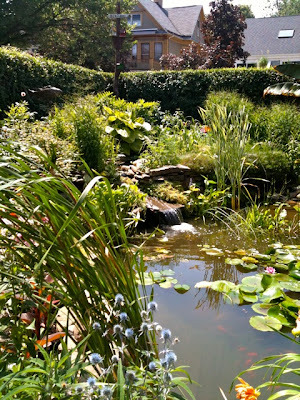 This is the garden blog of a friend of Gordon & Brian's. They have been featured in a couple different magazines and used on local TV, as stated in the post above, if you'd read it. 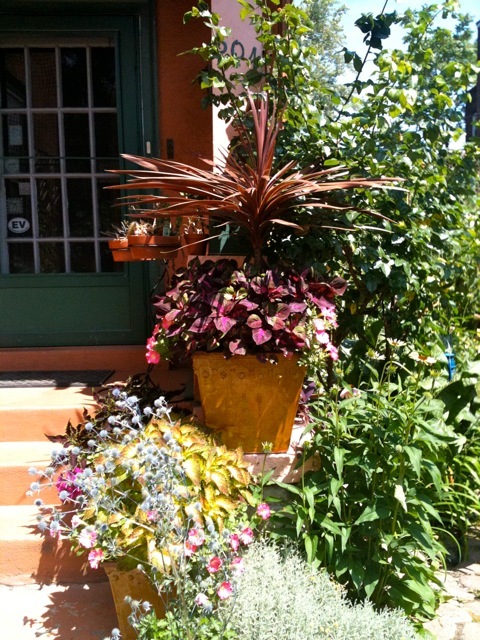 Not sure what the star-shaped flowers are, though they look like some sort of noicotia. 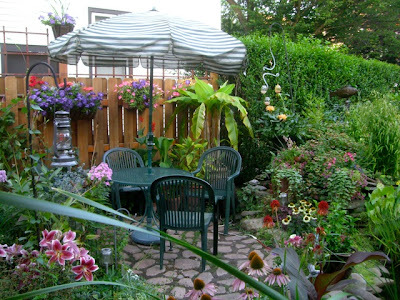 Their garden space is pretty protected and wind damage to large leaves may not be too much of a concern.